What Is a Short Squeeze, and How Can It Affect Your Investments? The stock market is a two-way street, and stocks are just as likely to fall as rise. Find out what some investors do to take advantage of this, and what risks might be involved, including the dreaded short squeeze. Traditionally, investing for the future involves buying stocks at a low price and hopefully selling them many years down the road for a much higher price, thus pocketing the difference. But, the stock market is a two-way street, and stocks have just as much of a propensity to move lower as they do higher. Even though the stock market has historically returned close to 8% per year, it doesn't mean you can throw a dart and land a winner every time. Investors who want to take advantage of those downward movements in stock prices can consider short-selling a stock. In short-selling, your brokerage firm will sell shares of the stock in question and credit your account with the proceeds. At some point in the future you'll need to purchase an equal number of shares of the stock in order to close the position. If the stock price moves lower, you make money. If the opposite occurs and the stock price rises, you lose money. The danger of betting against a stock via short-selling is that stock price declines are capped at 100%, because a stock price can't go below $0. However, if a stock doubles you'll lose your initial investment. If it more than doubles, then you'll actually owe money! Your losses are limitless, while your profits are capped when short-selling. The opposite is true of buying a stock, where your losses are capped at 100% and your profits are limitless. Yet there's another built-in concern to short-selling that some pessimists fail to account for: the dreaded short squeeze. What is a short squeeze? A short squeeze generally occurs when there is positive news on a stock, or simply an increased demand for shares of a stock, which causes the price of the stock to rapidly rise. Understanding that a rising stock is bad news for short-sellers since it means they're losing money, they'll try to exit their position (what's known as "buy to cover" their short-sale position). However, in a short squeeze it may not be easy for short-sellers to cover their shares. Furthermore, buying to cover only pushes the stock price up even higher, exacerbating the situation (and losses) for remaining short-sellers. Although a short squeeze can occur while a short-seller is in the black on their position, short squeezes are most often associated with short-sellers losing money. How do you determine if a stock is a short squeeze candidate? To determine whether or not a stock is a candidate for a short squeeze, investors would be wise to consider two metrics. The first is a stocks' short shares as a percentage of float, or the amount of shares currently held by short-sellers as a percentage of available, tradable shares. Generally speaking, the higher the short percentage relative to float, the higher the possibility of a short squeeze occurring. 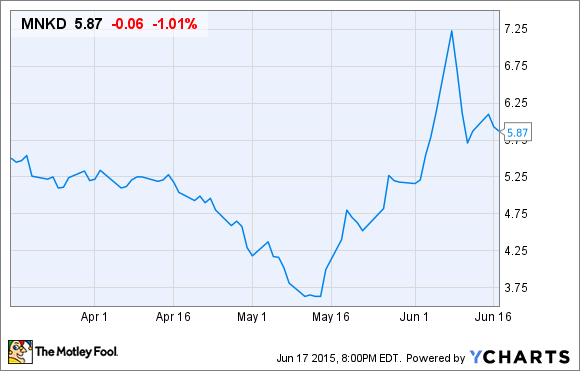 For example, as of Tuesday, June 9, 2015, there were 88.6 million shares of Ford Motor (NYSE:F) held by short-sellers. On the surface it might appear that investors were making a very bearish bet on Ford, until you realized that the company had 3.66 billion shares in float. In other words, with a short percentage of float of just 2.6%, a short squeeze there was unlikely. This is what a short squeeze looks like. MNKD data by YCharts. But, biopharmaceutical company MannKind (NASDAQ:56400P706), the developer of inhaled diabetes medication Afrezza, is a perfect example of a company that is susceptible to a short squeeze. As of June 9, 2015, 131.2 million shares of MannKind were held by short-sellers compared to a float of just 263.4 million shares. That works out a short percentage of float of 51.2%. Not surprisingly, MannKind's stock had a rapid reversal from as low as $3.46 intraday to more than $7 over the span of four weeks, likely fueled by short-sellers covering their positions. Another important metric you'll want to monitor, which sort of builds on the short percentage of float figure discussed above, is days to cover. Days to cover is simply a measure of how many short-sold shares are currently outstanding versus a stock's average trading volume over a three-month period. For instance, if a stock traded 100 shares daily but had 500 short-sold shares outstanding, it would (theoretically) take five days for short-sellers to completely cover their positions. A higher days-to-cover figure generally signals a greater potential of a short squeeze occurring. Diagnostic test developer Myriad Genetics (NASDAQ:MYGN), which is best known for its BRACAnalysis test that helps women determine if they carry the mutant BRCA1 or BRCA2 gene, which comes with a higher risk for breast and ovarian cancer, had a days to cover total of a whopping 67 at the time of this writing! There were 28.7 million short-sold shares outstanding, but average daily volume on the stock was a mere 431,000 shares. If positive news were to hit the newswires, short-sellers could be unable to exit their position without hefty losses. Ultimately, there are risks to investors on both sides of the trade; but based on the data above you'll need to be extra cautious and have a considerably higher tolerance for risk if you're going to short-sell a stock.